With its white sandy beaches, pine and oak forests, near-desert plateaus, snow-capped peaks, traditional villages, lush river valleys and olive groves, the GR7 in Andalucía takes you on a journey through the most geographically diverse region on the Iberian peninsula. This wonderfully varied route starts at the southernmost tip of Spain on the coast at Tarifa, and meanders through the provinces of Cádiz and Málaga before dividing. The northern fork heads through Córdoba and Jaén provinces (718km in total), while the southern fork passes through Almería and Granada (735km). The route crosses seven stunning natural parks and the Sierra Nevada national park, home to mainland Spain's highest peak – Mulhacén. Andalucía is most famous among holidaymakers for its coastline – a haven for sunseekers – but the GR7 offers the opportunity to see another side. You will explore little-visited hidden gems, enjoy the natural parks and visit unspoilt peaceful villages. The GR7 is also a great journey through history and cultures of the past and present. It is the place of the Moors? last stand and grand fortresses and watchtowers bring to life aspects of the eight centuries of Arab rule alongside some internationally significant prehistoric sites. 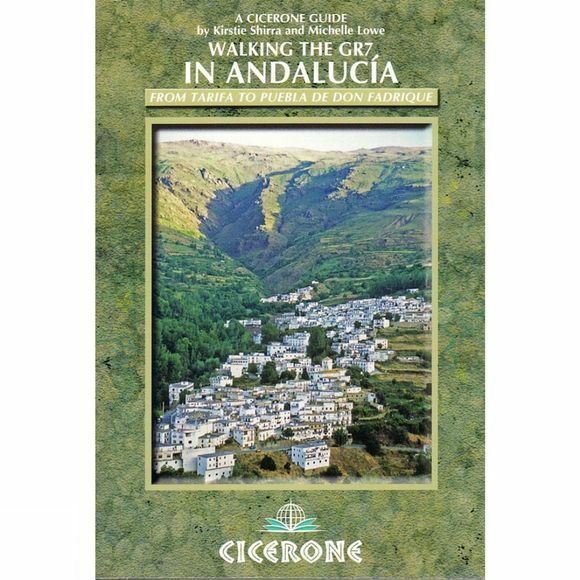 • The first guide to cover the whole of the GR7 in Andalucía. • Detailed route description for around 60 days of walking, with options for creating shorter sections and days. • Information on all the villages en route including accommodation so that you can plan your own route.